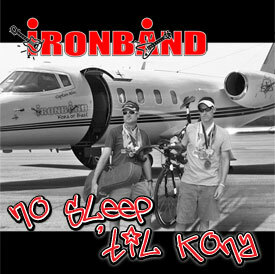 Ironband | “No Sleep ‘Til Kona” in stores now! The trifecta of shows last weekend provided the perfect opportunity to debut several of the songs on the new album in a live setting. In between the occasionally confused and surprised faces of the un-initiated race spectators were the always-appreciated smiles, laughs, and arm-pumping from the spectators and racers. For those of you who asked about the title track, yes, “No Sleep ‘Til Kona” is a cover of the Beastie Boy’s “No Sleep ‘Til Brooklyn” (which, incidentally, was a play on the fabled Motörhead album, “No Sleep ’til Hammersmith” for you music history buffs). Actually, it’s not so much a cover, since we re-wrote the lyrics, but nonetheless to keep Ironband in good standing with all applicable licensing and copyright laws, we did, in fact, apply to the Beastie Boys and Polygram Records for a license to distribute our own recording that song. Oh yes, this is the big time. Super big time. At any rate, the new album hit stores last week so head on over to iTunes, CDBaby, Amazon, Zune, or your favorite digital music outlet today. Our music has reached six of the seven continents judging by visits to the website; you still have a chance to be the first person on Antarctica to download our music. Come on South Pole, where’s the love?